We have moved in. We love our new house but we are now in a community-wide limbo of development. Sure there has been some post-possession calming down for us but the neighbourhood is one big bustling construction site. Noise - There is So Much going on! The construction of other homes continues on in the Riverstone Community. These guys start early! During the summer, with the kids not having to get up early for school, we had hoped to sleep in a little but not a chance with all the noise. We often hear big trucks rumbling by as early as 7 AM. Excavators, bulldozers, Bobcats, dump trucks, delivery vehicles and other large vehicles operating heavy equipment all day long. 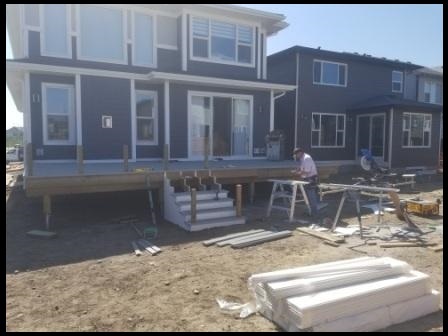 Supplies are being delivered for building decks, screened-in rooms, backyard landscaping and pouring of concrete driveways. Oh wait. That was us. We were no different. We have contributed to that same kind of noise. Green grass is not just a decoration. Without grass there is dust blowing everywhere. Remember the heat wave? Well, if we left the screen windows open at night to cool the house down then next morning the floors felt like grit. We had to dust, vacuum and mop every day. Thinking Ahead – Hooray Albi Riverstone! One of the things that we like about the community is that even though it is not finished by a long shot, there are already three small parks within a two minute walk. So that is a good thing.